The 2012 snooker season is already well underway. Last year our A Team finished fifth, a good result after their record breaking fourth place in 2010. The B Team consolidated their place in the first division, while the C Team's season ended with fifth place in division two. Individual players also achieved some notable successes. Jonathon Smith won the Jay Trophy for the second year running - along with first division's highest break of 65. Kevin Shackleton was runner up for The Taylor Trophy for the third year running. Mike Sullivan and Mark Anderson both reached The Rotary Cup semi-final. 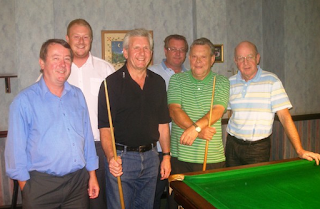 While John Higgins and Irvine MacDonald reached The Bert Astle Pairs semi-final. This year the Club is running two strong teams. Captain of A Team is Mike Sullivan and the B Team captain is Kevin Shackleton, with Both in the first division. This B Team photo shows, from left to right, Dave Nuttall, Will Bell, Dave Slater, Mark Anderson, Kevin Shackleton (Captain), Nick Thompson. The first matches were played on the 6th September. The A Team's had a home 4-3 victory over Morley Green, while the B Team notched up a 5-2 win away to Mere. However, new members are still welcome to join. All you need to do is contact one of the team captains. Visit the Knutsford and District Amateur Snooker League website to find all the latest results and see how the team are doing in their respective tables.